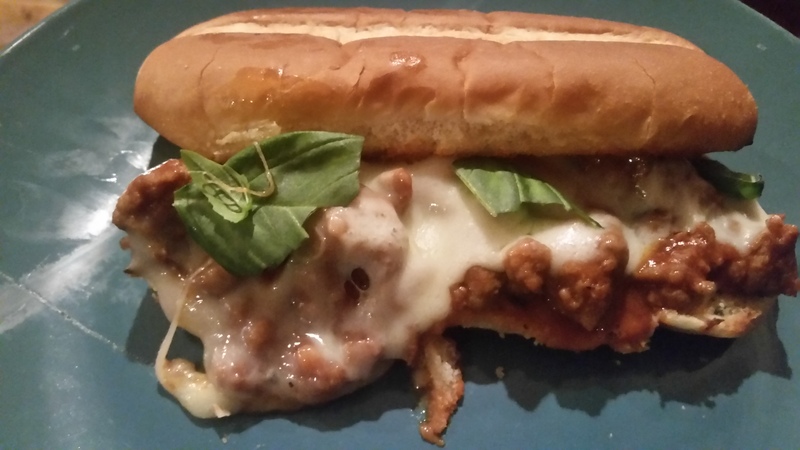 Garlic Butter Italian Sausage Sandwiches – What's for Dinner Moms? We buy most of our meat in bulk and on sale so I have to be creative in my dishes. We eat quite a bit of chicken breasts, chicken thighs and drumsticks, pork chops, and ground beef because they tend to be the meats that are on sale most often and are generally cheaper. Once in awhile thought we run across some thing that peaks our interest such as a beef roast or bulk sausage. That was this month. This recipe was a simple yet flavorful way to use a pound and a half of the sausage AND give us a great meal. Everyone declared this a do-over. Even me! It was super simple to make and had such a great flavor with the red wine in the sauce and the fresh basil over the top. We will be making this again real soon. For a compete meal add a hearty green salad with lots of fresh vegetables. In a small bowl mix together butter, garlic, basil and parsley. Mix until well blended. Cover and set aside while making sauce. In a large skillet over medium heat cook sausage breaking it into small pieces as it cooks. Once it is fully cooked drain off any excess fat. Add tomato sauce and red wine to the pan. Simmer for 15 minutes stirring occasionally. Once sauce is done remove from heat and add fresh basil, salt and black pepper to taste. Spread rolls with garlic butter and toast in oven until golden brown at edges. Remove rolls from oven. Remove the tops of the rolls from the pan and set aside. Place mozzarella cheese on the bottom half of the rolls. 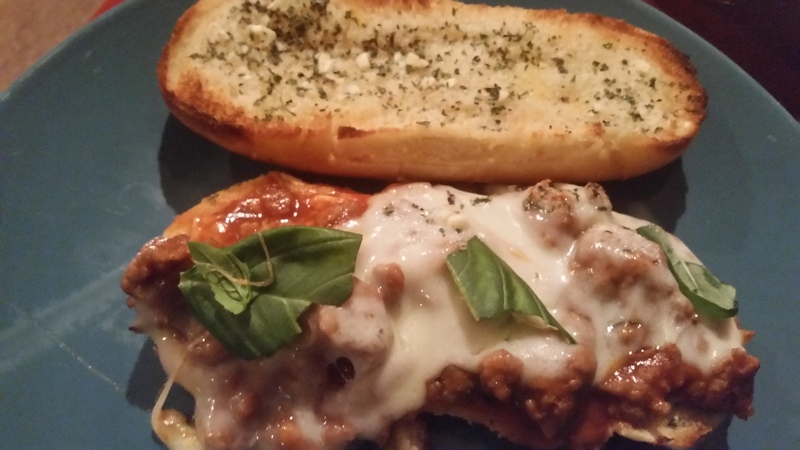 Top with meat sauce and then cover with provolone cheese. Place bottoms of rolls under broiler to melt cheese and let it start to brown. WATCH carefully! Remove pan and add fresh basil over tops of cheese. Cover with top of roll and serve. Next Post Quote Challenge – Happy Thanksgiving! This looks so good Marci! I want to eat this, what a unique idea, love it! Your welcome. It was my pleasure to enjoy. Making for dinner tonight.